Can you please explain your problem a bit more detailed? 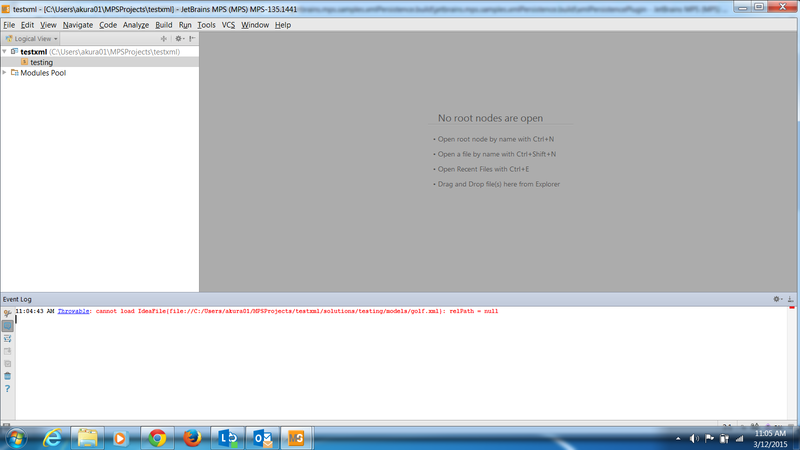 are you getting message: "cannot load ...: relPath = null"? Thanks for the Reply. I tried with MPS 3.2 RC and created a sample model and it got created. When I try to reopen the same model after closing the IDE, I got below Exception. It looks like you have somehow corrupted solution you are working with. I was not able to reproduce this problem.. Can you please share your project with me (if it's not too big)? Pfa project for your reference. Looks like something is wrong in your local copy of SampleXmlPersistence project. I can suggest you to try reinstalling SampleXmlPersistence sample, re-deploy corresponding plugin and reopen this project. I deleted all MPS folders and uninstalled MPS and installed the same version of MPS ie MPS3.2(build 139.1988). I ran on two separate machines with Windows 8 and for both machines , I got same error after reloading the model created by sample persistence plugin. Is there any kind of per-requisite or steps to be followed. I am not sure why I am getting relPath=null. Update - I tried the same in Mac and it worked fine.Not sure why in Windows I am getting relPath=null. Any idea/suggestions? I tried with Win7 machine and still I got same exception. Please find the attached screenshot. indeed, this looks like a problem in MPS that only shows up on Windows (https://youtrack.jetbrains.com/issue/MPS-21671). We've identified the cause and are working on a fix.